The x264 should be more efficient than MPEG2 (DVD), therefore it should make about same quality video that takes LESS space when 1 converts MPEG2 (DVD) to MPEG4. My question is what size, %, or bitrate should I use to get smallest size without losing too much of the original DVDs quality? Should I aim at x% of average original bitrate, size of video? And at what "x" should I start to get a good compromise. I am also talking about just the movie size, without menus, extras. I also don't need to have exact final size. Welcome to the forum Sn8kbordin. Please don't cross post (post the same thing all over the place - I saw your post on the TVersity forum as well), as that's against the forum rules. As for your question, I would aim for 2 to 3 Mbps if you truly want to preserve the quality of the DVD (DVDs use MPEG-2, at around 5 to 7 Mbps). This is quite a high bitrate to use, but it will mean that the output is very close to the original even if you watch very close to the TV/monitor - a typical 2 hour movie is than around 2.5 GB. However, if you don't mind in losing some quality that you won't be able to tell over a few meters anyway, then you can use anywhere between 1 and 1.5 Mbps - 2 CD (1400 MB) DivX encodes, say for a 2 hour movie, will have an average of 1.5 Mbps, but with the more efficient H.264, you can get that down to 1.2 Mbps or even slightly less than that. But if it were up to me, mainly because H.264 takes so long to encode, I would not use it if all you want is the slight improvement in file size. I would use it to encode a file that is the same size as a DivX/XviD encode, but this file will have better quality. 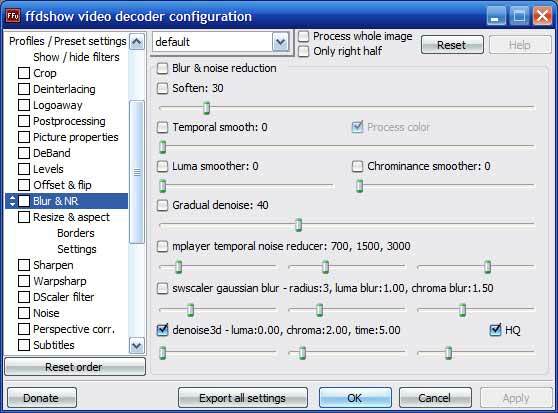 So I can't select just a quality setting and do one pass and have the codec figure out where what bitrate to use? I have to set average bitrate and do 2 pass encoding? Also what audio profile do I select if my DVD source does NOT have 5.1 audio, but stereo. THe guide says to select "NDAAC-LC-MultiChannel-192Kbps" but my source is only stereo. 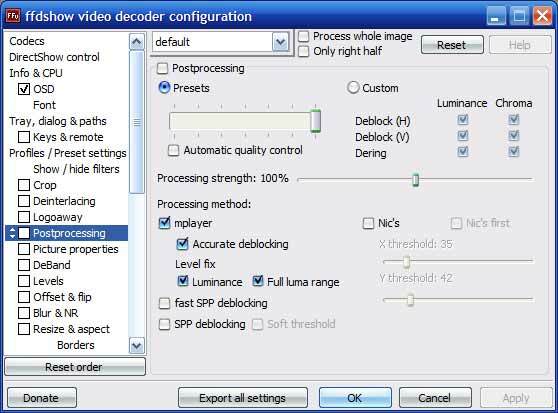 There is not "quality" slider in x264, but you can use one of the presets to get one pass encoding at set quality levels. I prefer to set an output size instead, since the "quality" setting give you unpredictable output sizes. If your source is only stereo, use the NDAAC-LC-96Kbps profile (96 Kbps should give you equivalent of at least 128 Kbps VBR MP3, which will be good quality). Would one pass encoding have lower quality than 2 pass if the final size would be very similar? Also, when streaming videos other than h264 thru TVersity I like the ffdshow to postprocess them, but when I have ffdshow resize them they don't play to the end. What I wanted to do was to encode them into h264 with all the post processing. They are VCD MPEG1 or MPEG2 videos. What Avisynth filters could do that for me?